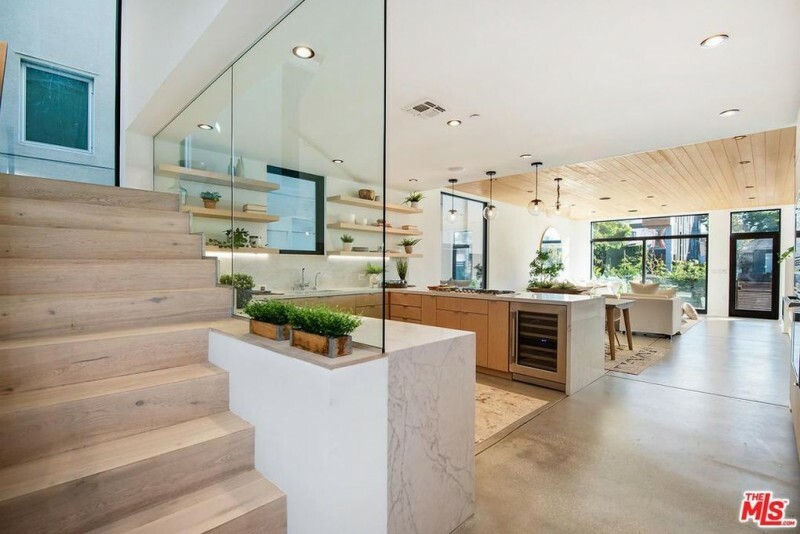 Utah Jazz player Dante Exum scored big with the purchase of this visually compelling Los Angeles-area contemporary. Exum dropped $3.36 million on the Venice home, which boasts exterior architecture and detailing that both defines and playfully subverts the often severe style. The house went up just last year; its interiors span 3,300 square feet, with three bedrooms in its three stories of living space. The shared living areas are open-concept, as expected, with good flow from the kitchen and dining area to the living room. The concrete/warm wood contrast is used extensively, but warmth prevails; a beautiful wood-clad ceiling and a fireplace makes the otherwise all-white room inviting, and carefully composed, too. Three bedrooms in a home like this usually indicates a larger-than-usual master suite, and in this case the upper floor is dedicated to this sanctuary. Another wood-paneled ceiling gives it warmth and cohesion, and a wall of glass sliders opens onto the balcony, offering a touch of liberation. Venice streets are a bit cramped; Exum’s new property does as the Romans do, and improvises exterior living space by way of a rooftop deck.